Electro-Cap CS Series: Large - BrainMaster Technologies Inc.
Electro-Caps are an EEG electrode application technique. They are made of an elastic spandex-type fabric with recessed, pure tin electrodes attached to the fabric. The electrodes on the standard caps are positioned to the International 10-20 method of electrode placement. 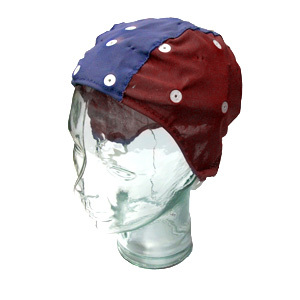 Large Electro-Caps are designed for heads with a diameter of 58-62 cm and are blue in color. For use with BrainMaster Discovery and BrainMaster Mini-QII.